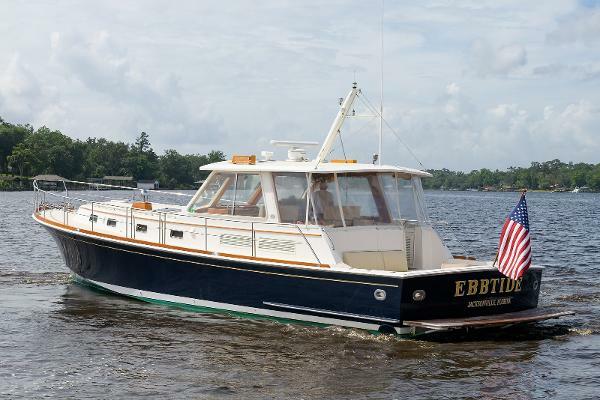 EBBTIDE is a 2002 Grand Banks 49 Eastbay HX. 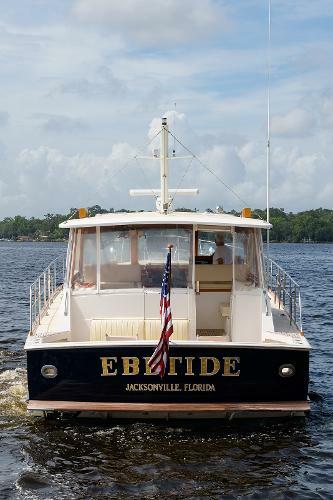 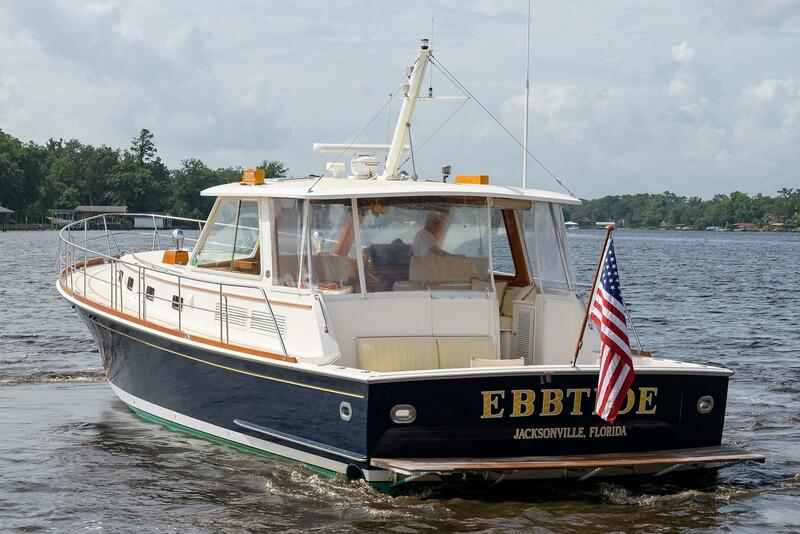 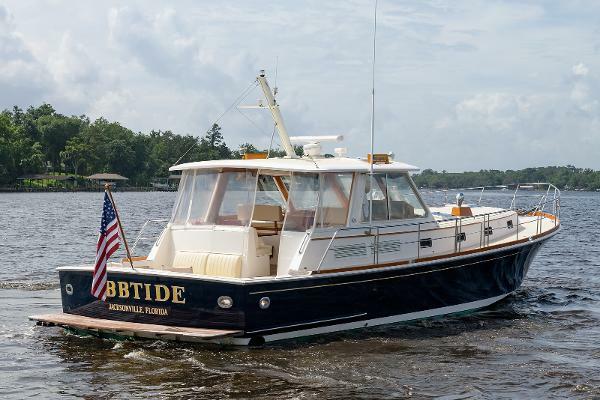 EBBTIDE has been with her original owner since new and has been expertly taken care of by this seasoned boater and boat owner. 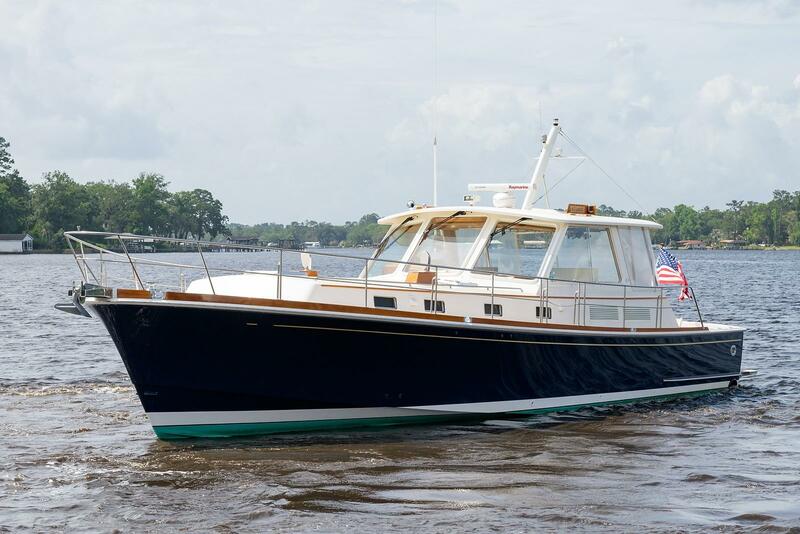 She glistens from her painted Flag Blue hull to her freshly waxed and polished bow and topsides. She has been kept under cover her entire life, so has escaped the bright Florida sun and summer heat. 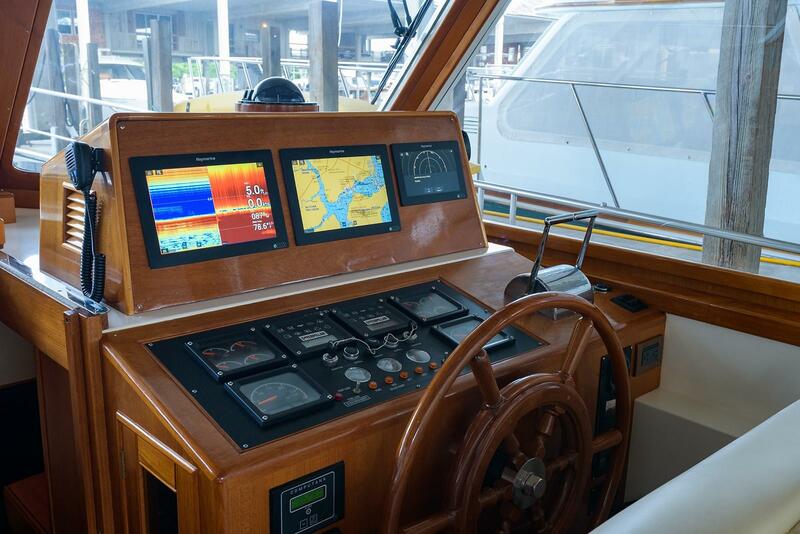 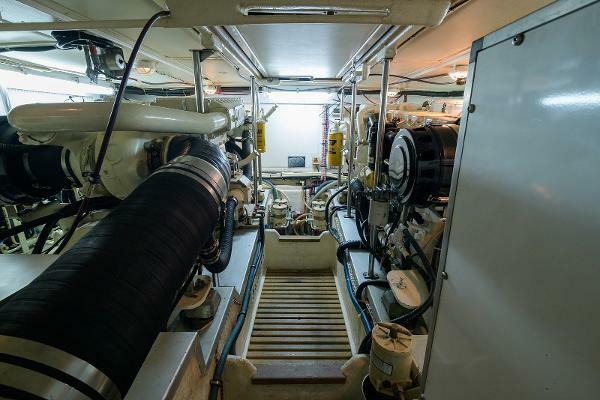 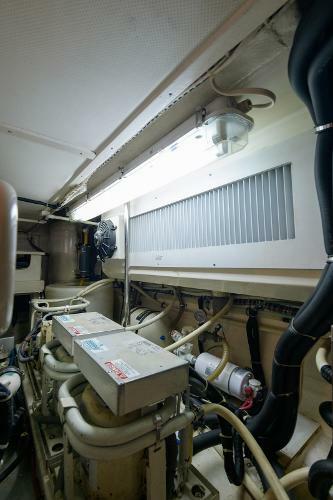 She has updated Raymarine electronics and has had her 1000 hour maintenance on time and all services are up to date. The 49 Eastbay set the bar for a high performance sea boat that is also luxurious and one you can be proud to own. 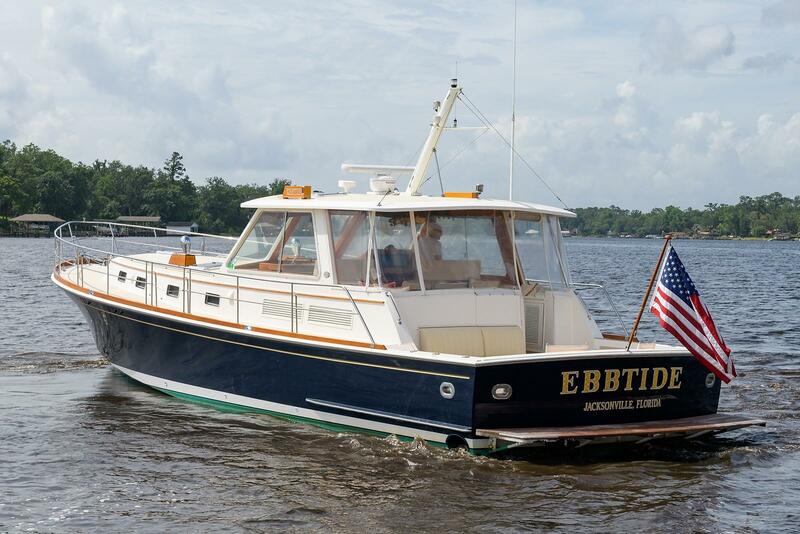 EBBTIDE has served her original current owner well and is offered for sale as they want to pursue other dreams. 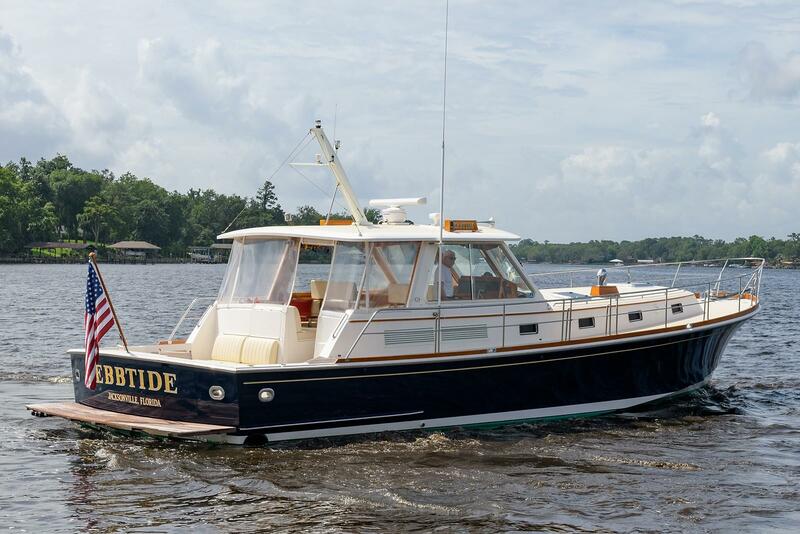 New Raymarine electronics - 2017 Hull painted Flag Blue - 2014 1,000 hour service done at 960 hours, all services up to date Original owner Boat kept under cover since new Standard 49 HX layout with full U-dinette below, island berth forward and twin side to side berths in port guest stateroom, most popular and user friendly layout! The electronics were replaced in 2017 with new. Grand Banks is known for high quality construction and the Eastbay line is no exception. Ebbtide has received consistent maintenance, both cosmetic and mechanical, since new. 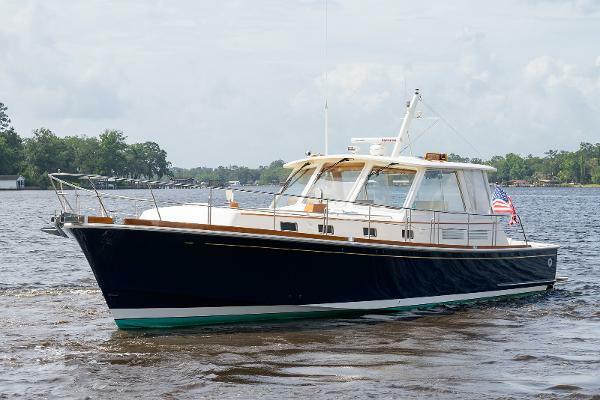 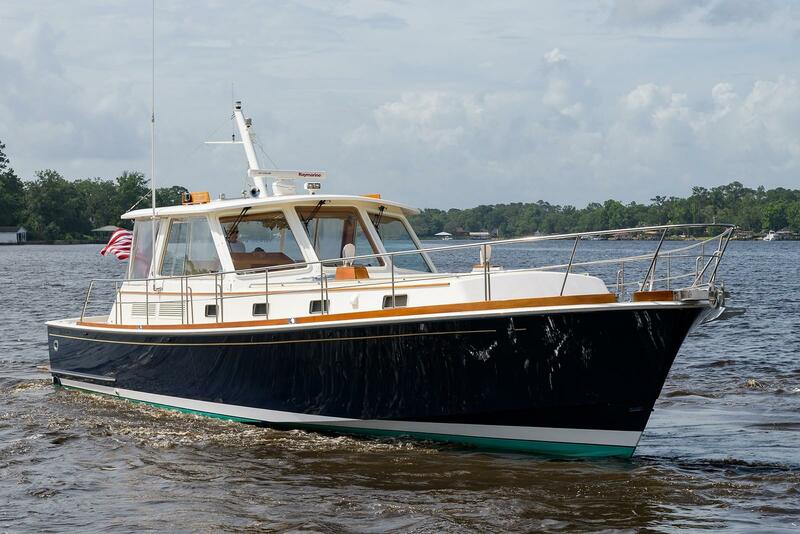 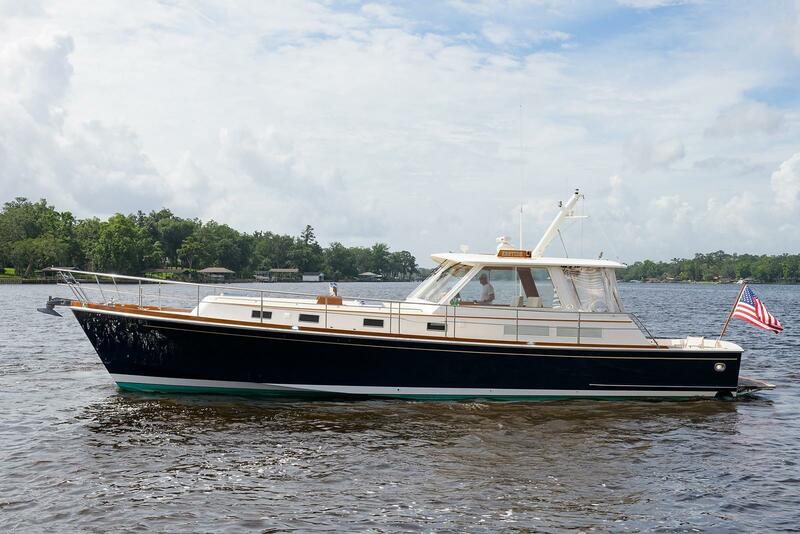 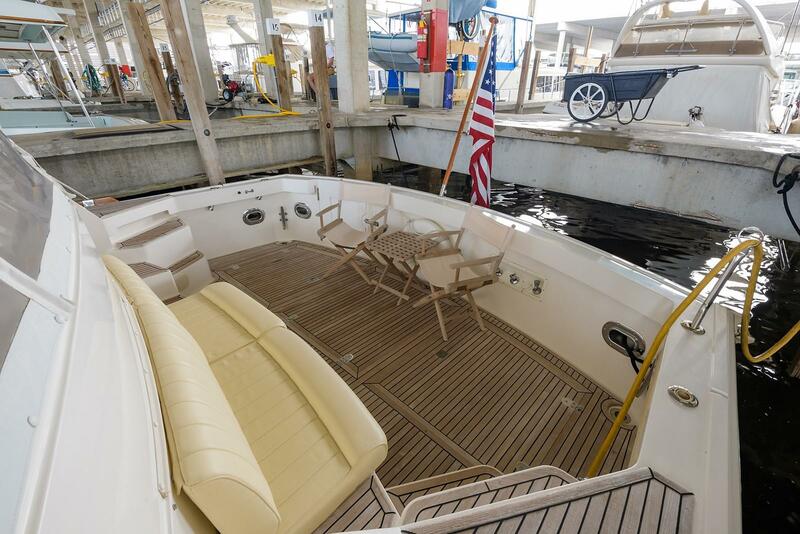 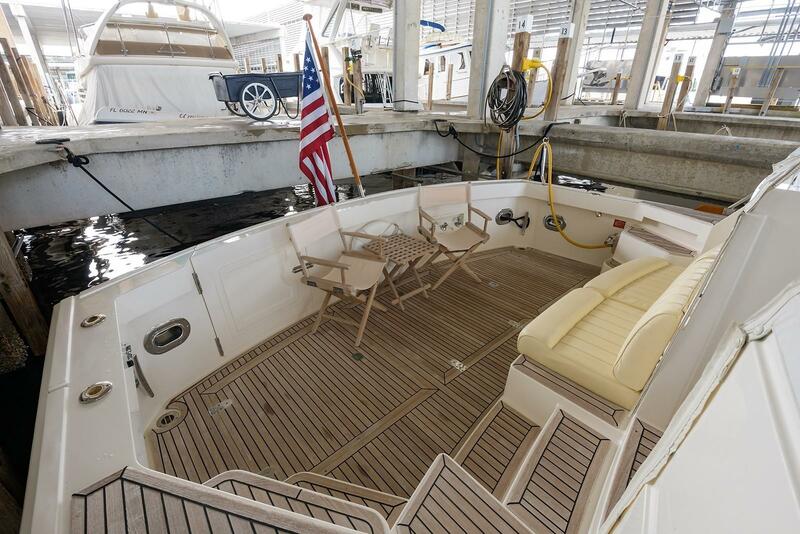 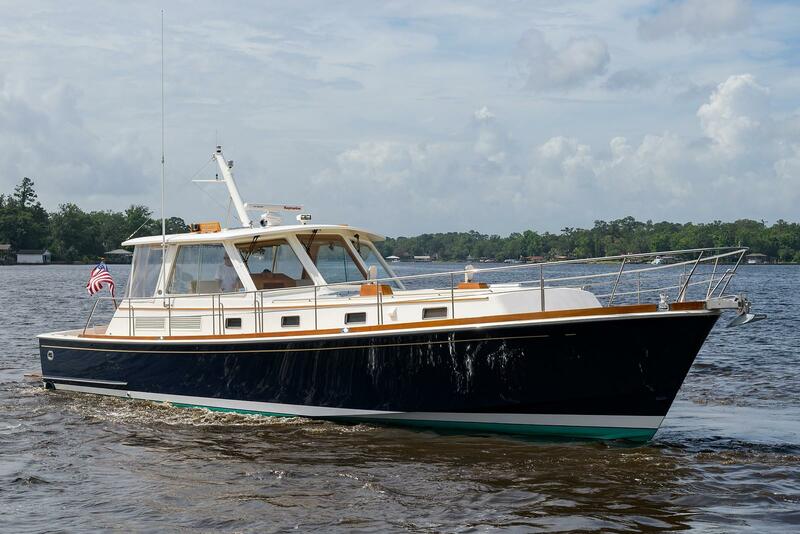 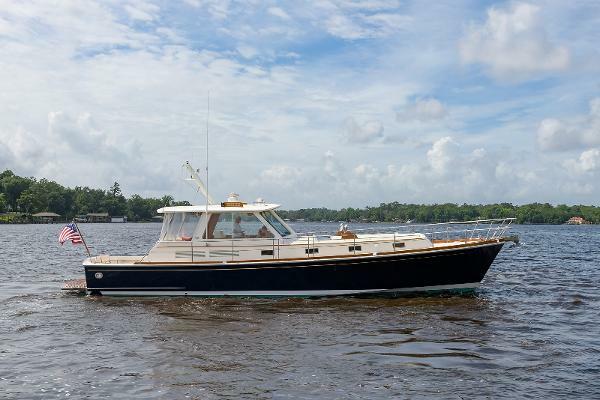 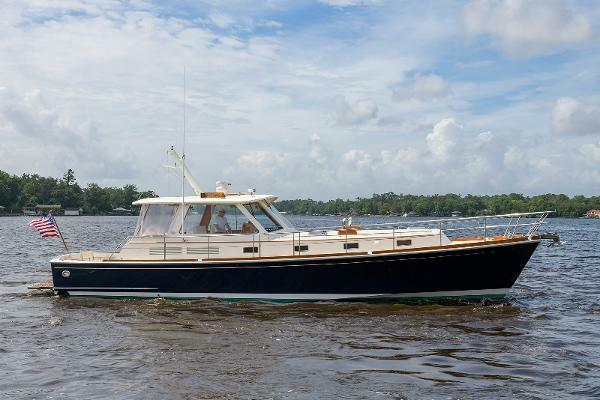 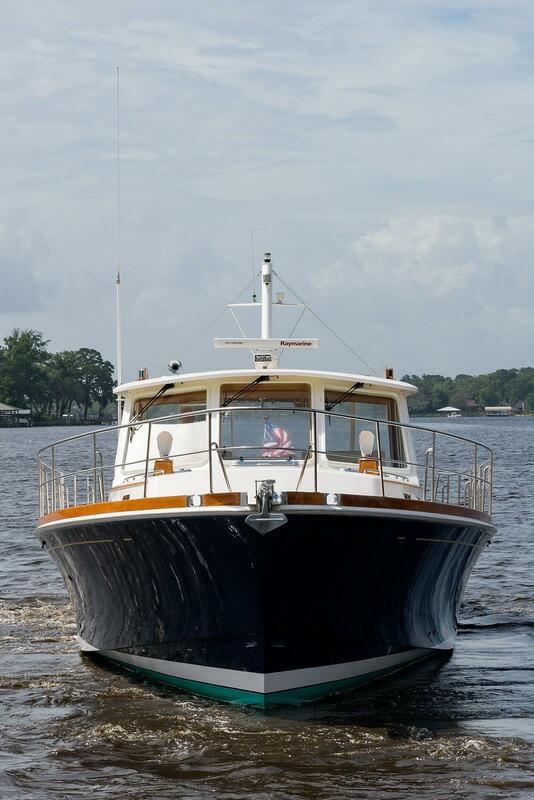 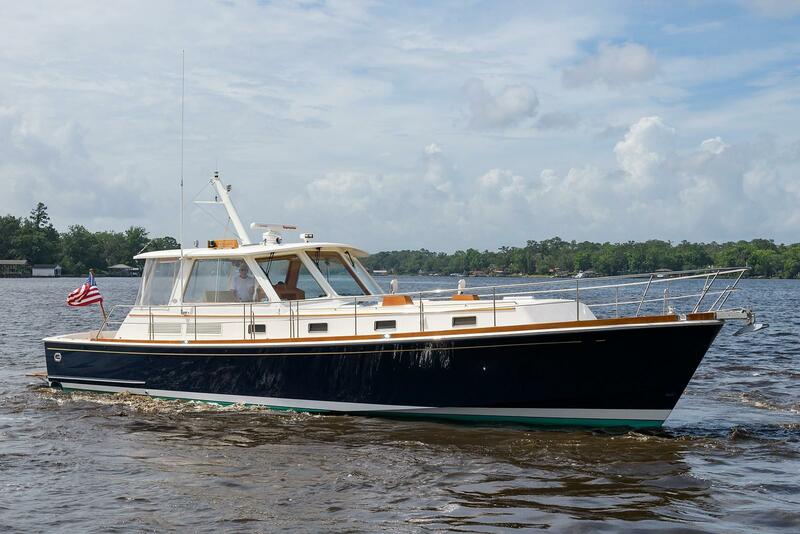 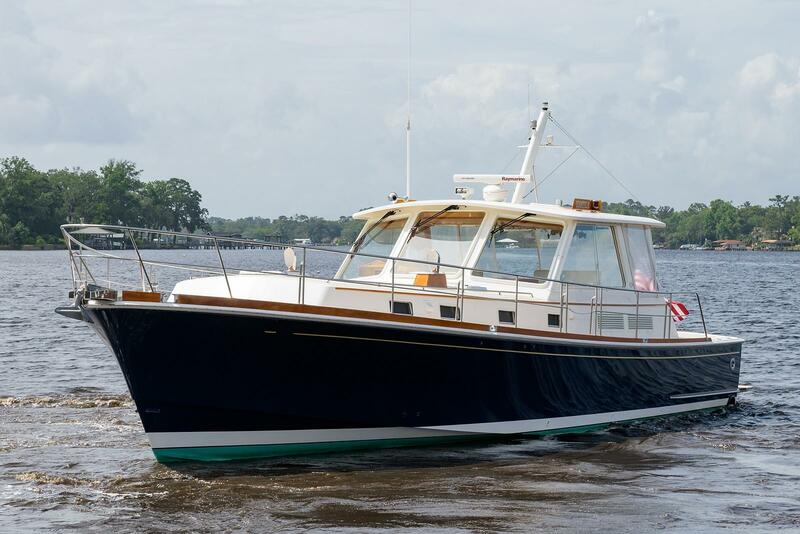 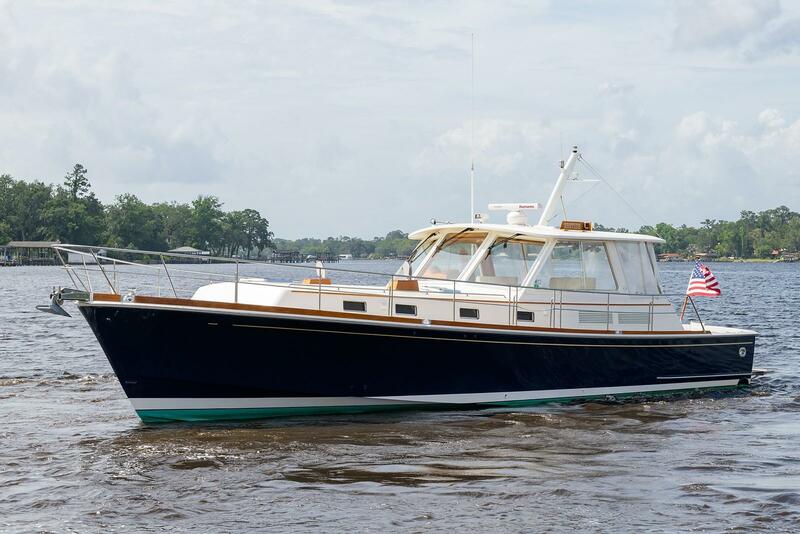 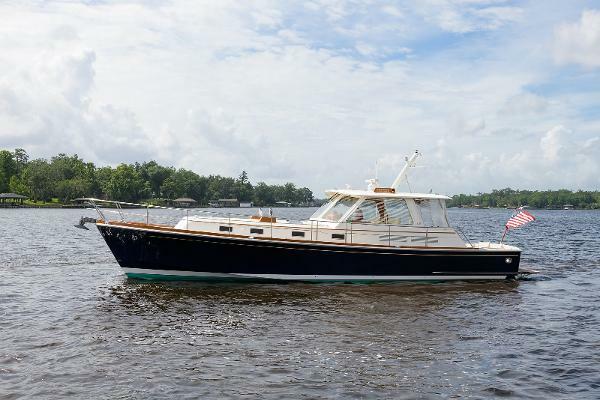 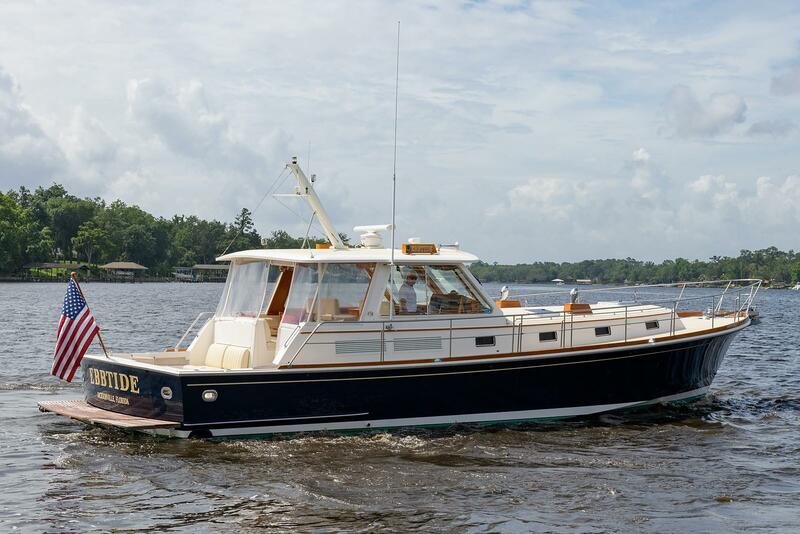 Excellent care coupled with high quality build methods and materials, combine to present this 49 Eastbay looking much younger than her actual years. 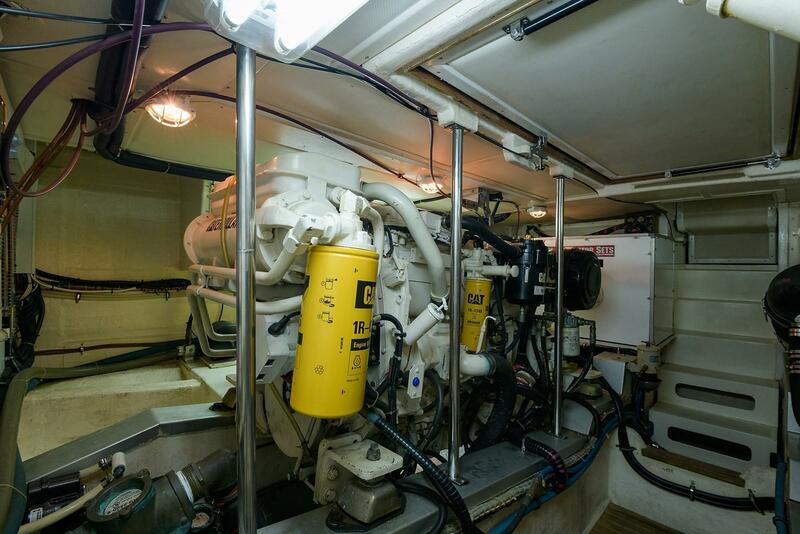 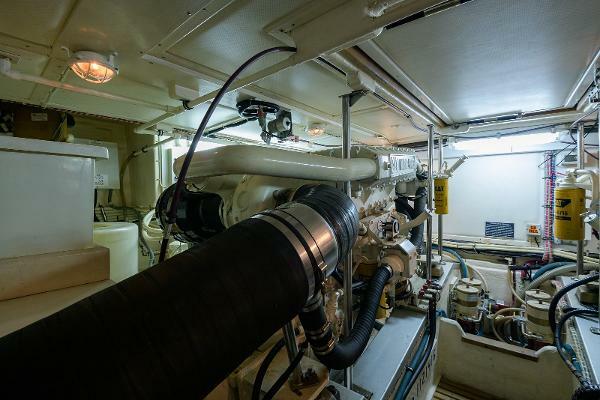 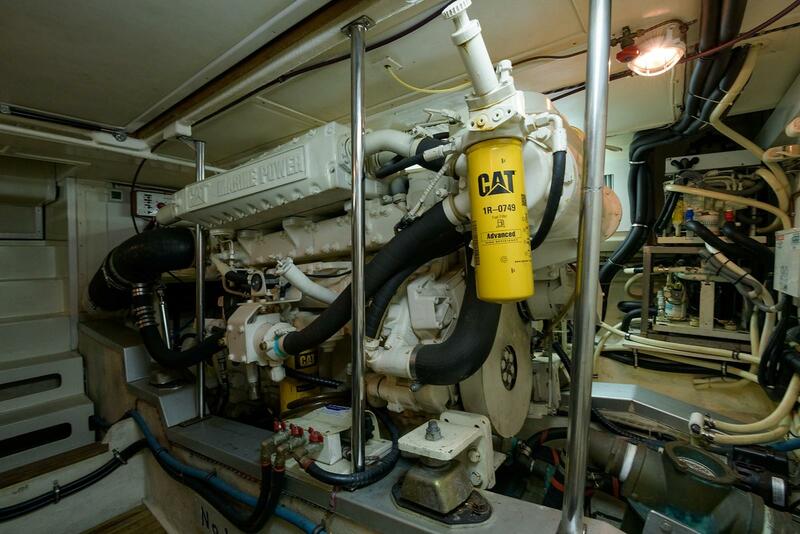 These 3196TA CAT engines, were not part of the recall and have performed flawlessly since new. 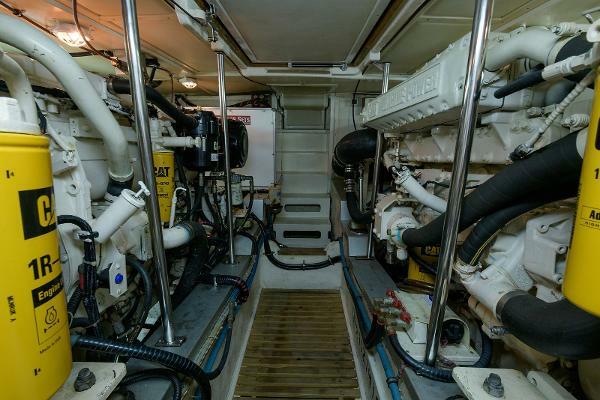 They received a 1000 hour maintenance at 960 hours and have been serviced at regular intervals, since then. Batteries have been changed when needed. 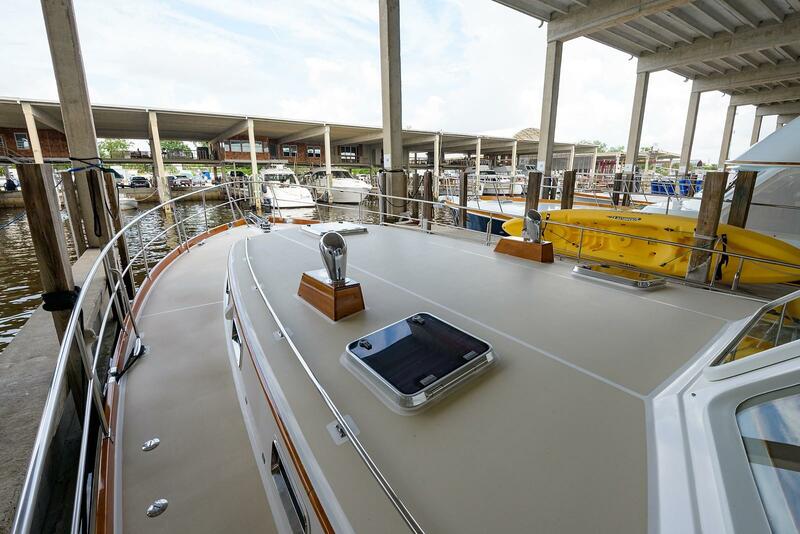 New house batteries and charger, were changed out, September, 2017. 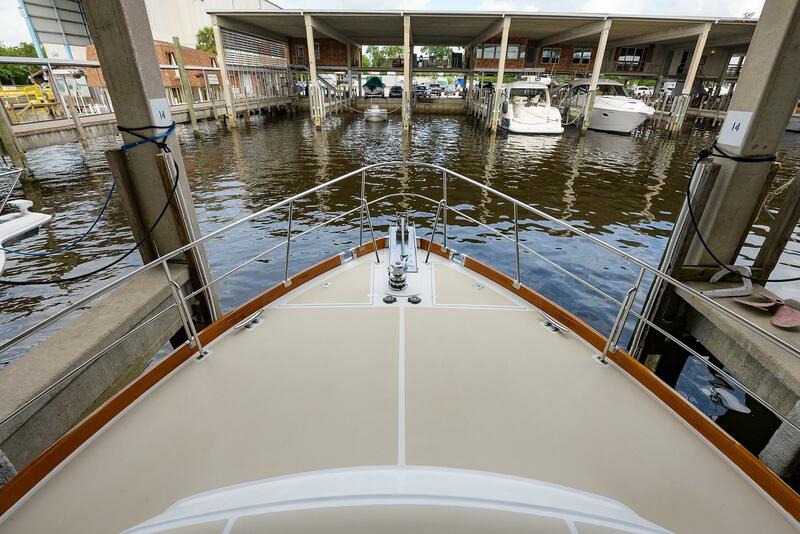 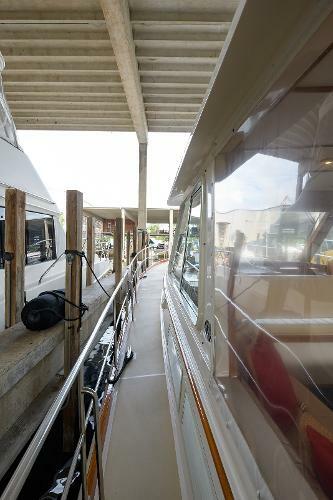 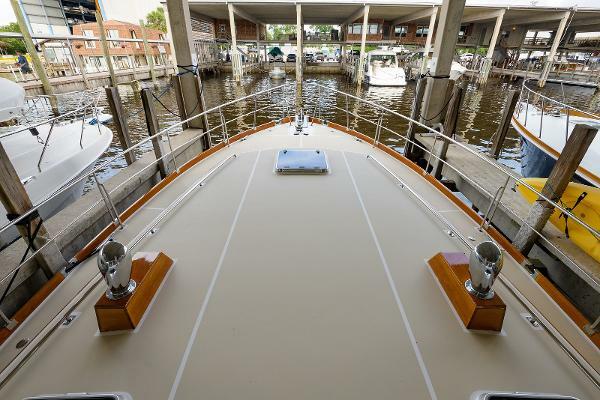 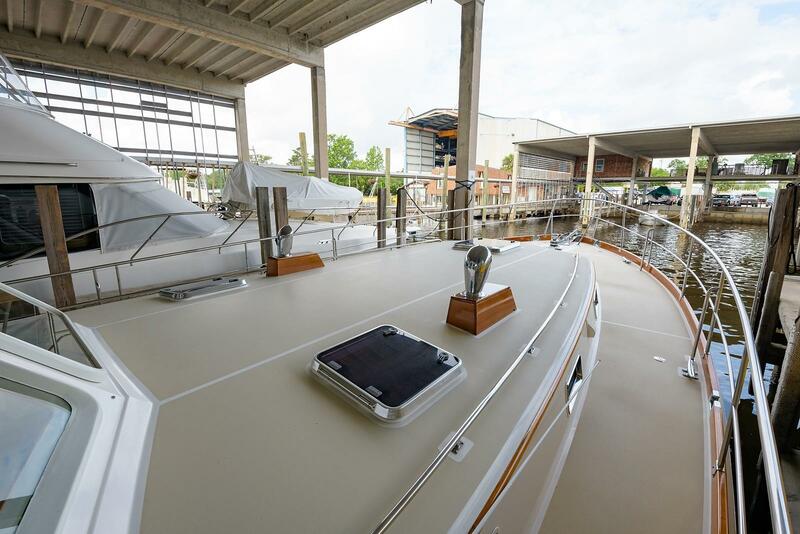 The gel coat on this boat glistens, due to being kept under cover dockage, her entire life. 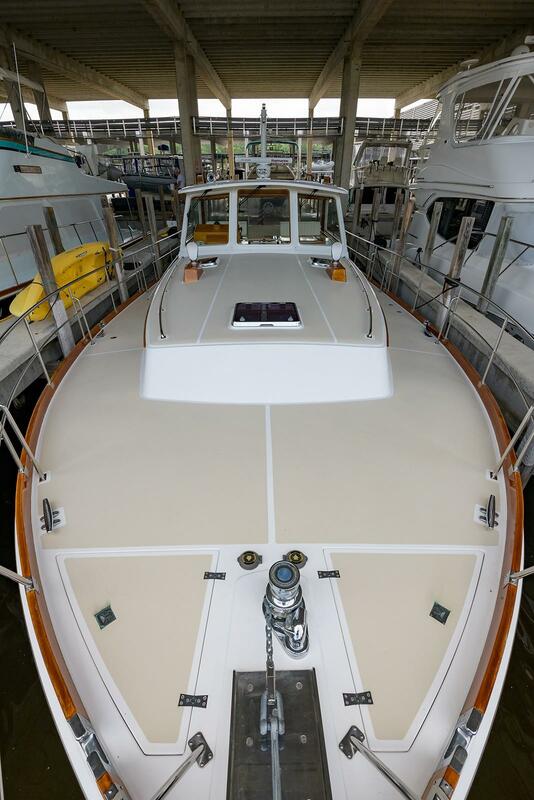 Her blue gel coat hull was painted Flag Blue, in 2014. The cockpit deck is wide and deep enough for chairs and table. 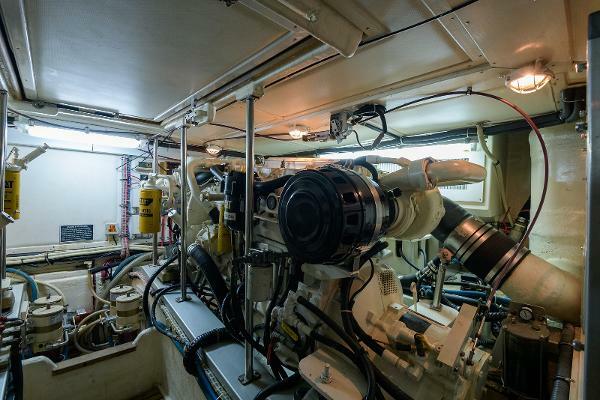 There is a large lazarette storage area, accessed by three hatches. 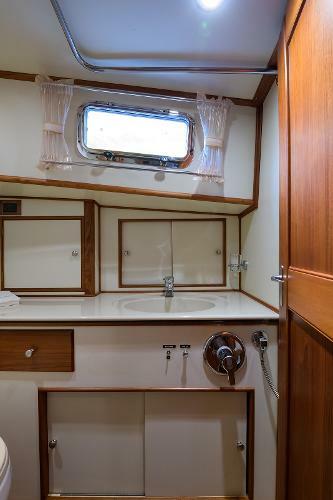 The lazarette has teak grates that keep any items stored from being in the bilge. 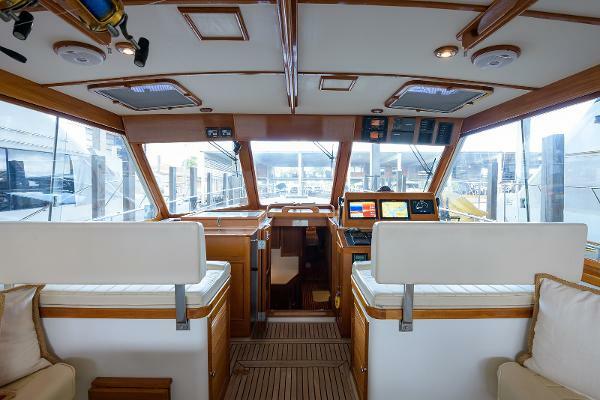 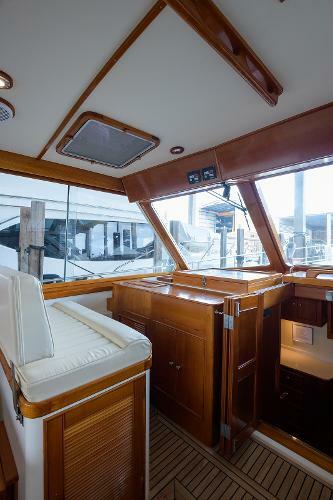 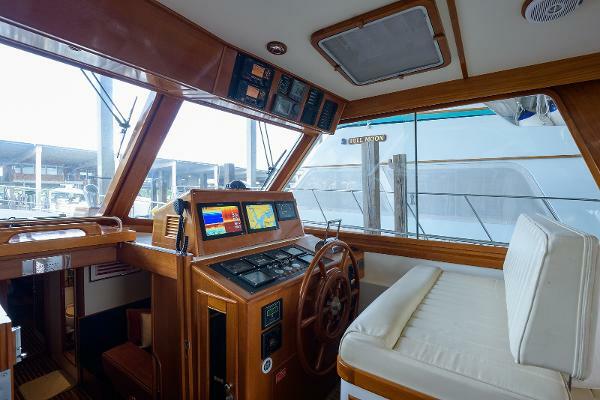 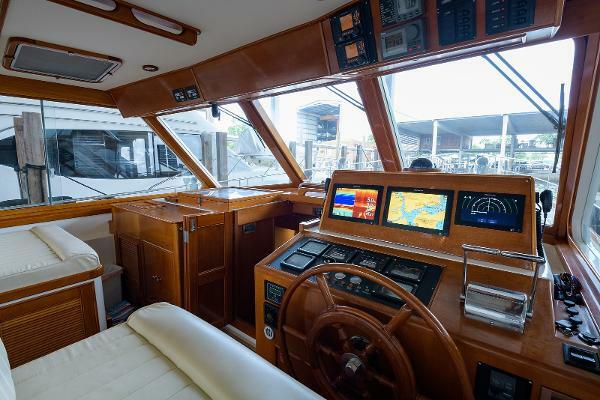 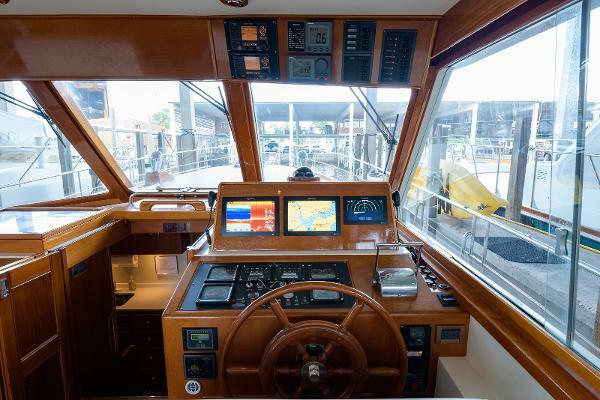 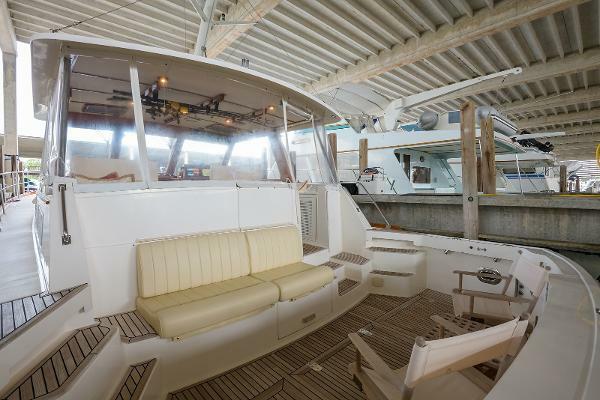 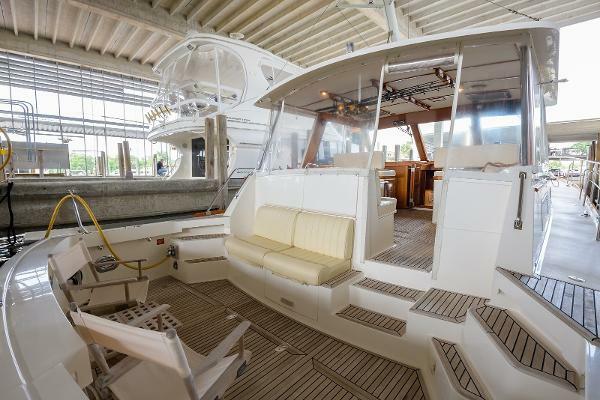 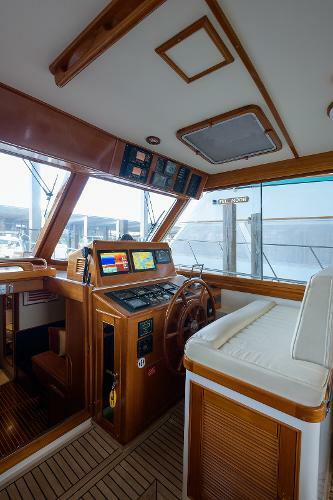 The helm deck is a welcome space to get out of the sun and/or cool weather. 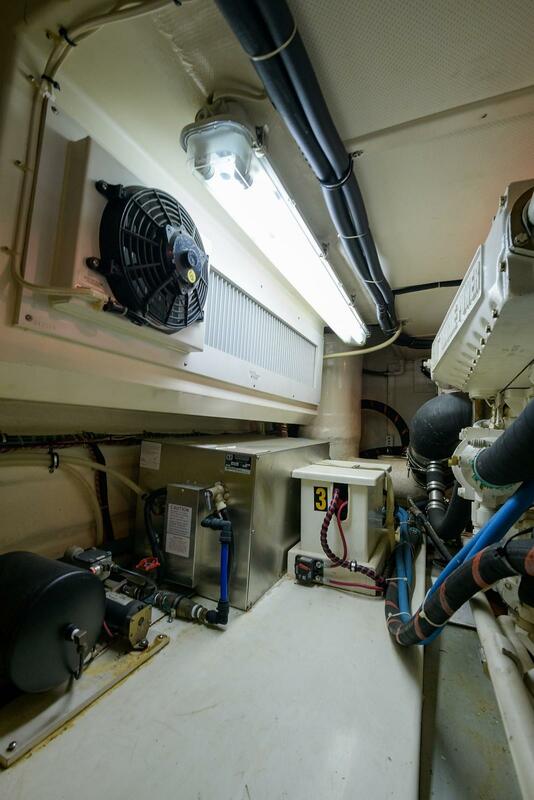 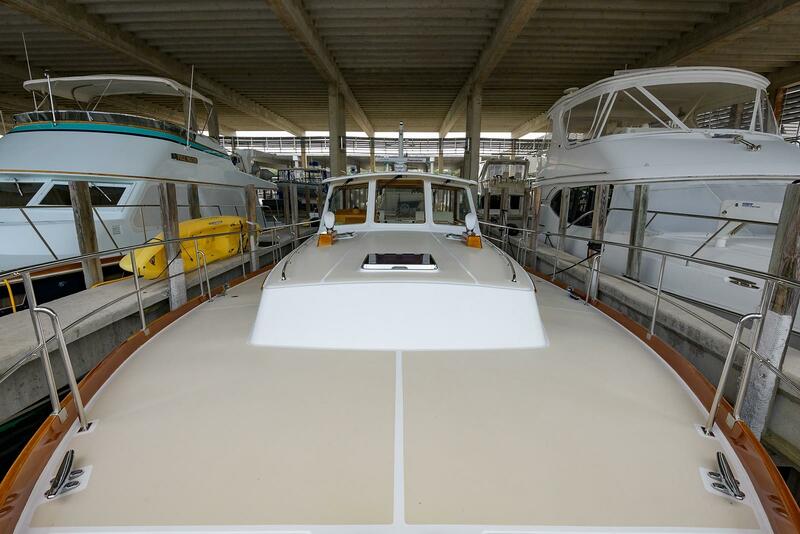 Two 16,000 BTU air conditioners, keep this area cool or warm, making this an all weather boat. 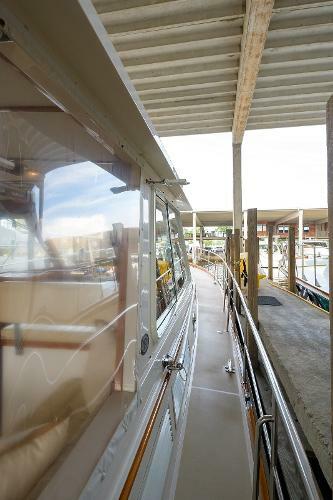 Visibility is excellent with large windows, some that slide open. 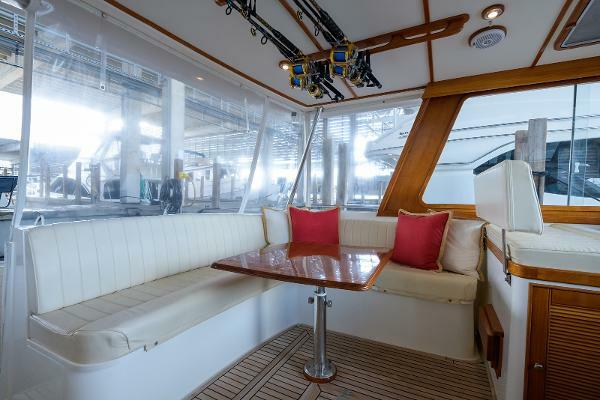 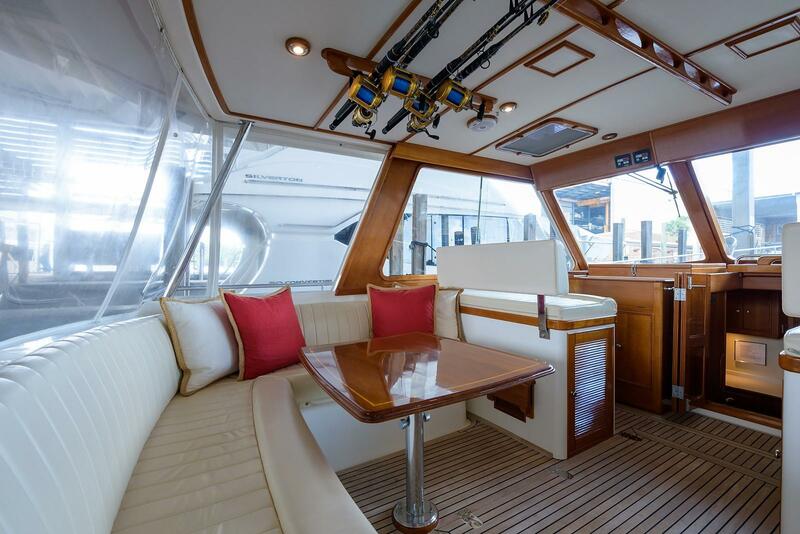 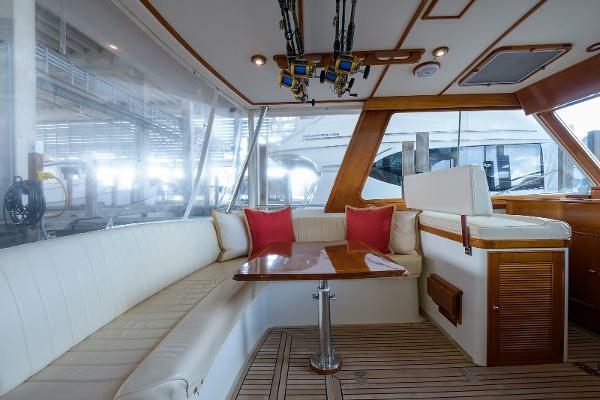 Plenty of seating give family and guests a comfortable place to be while underway, or in port. 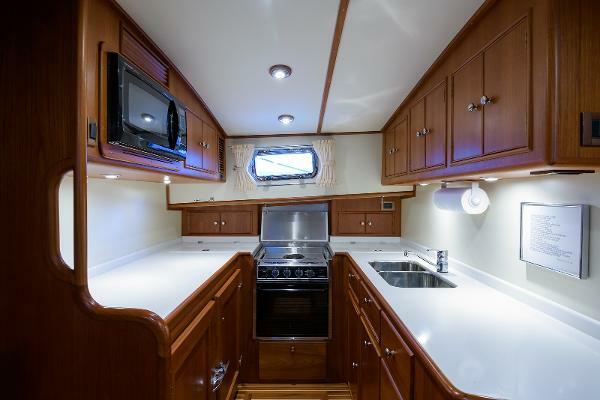 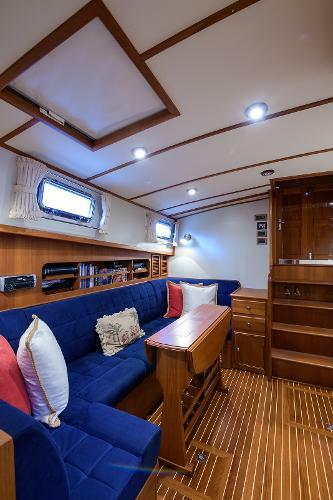 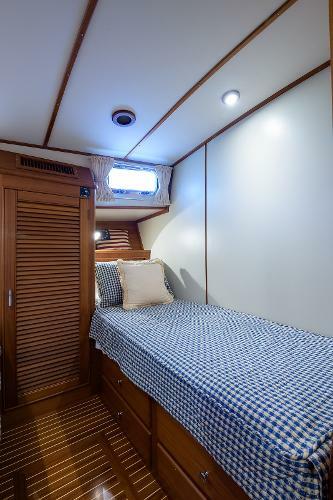 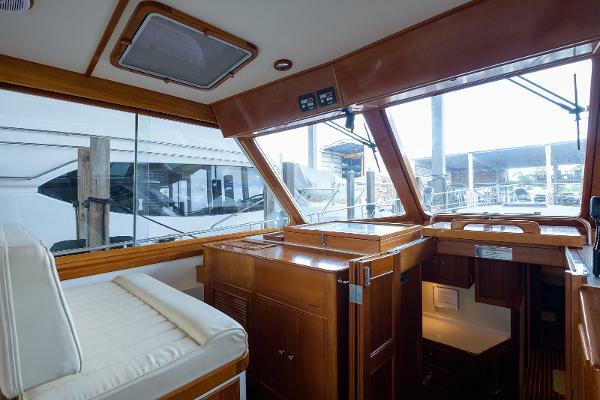 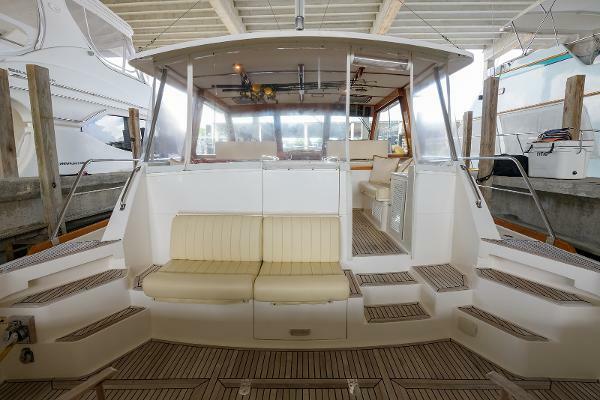 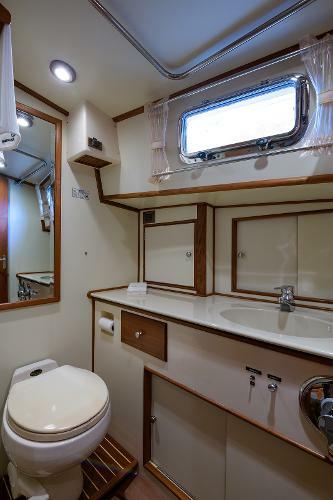 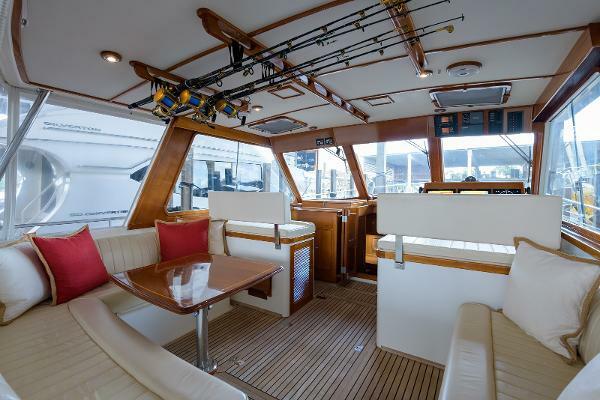 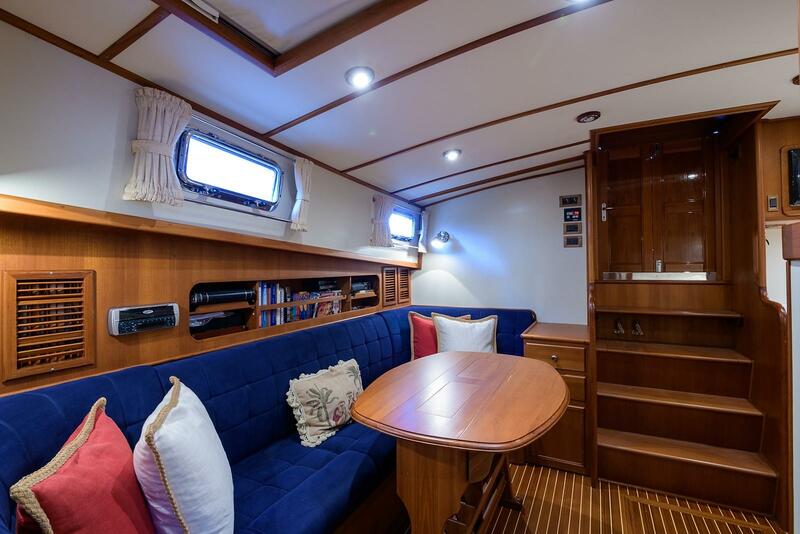 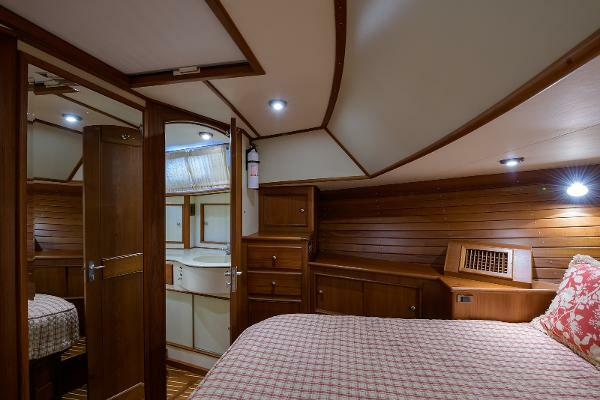 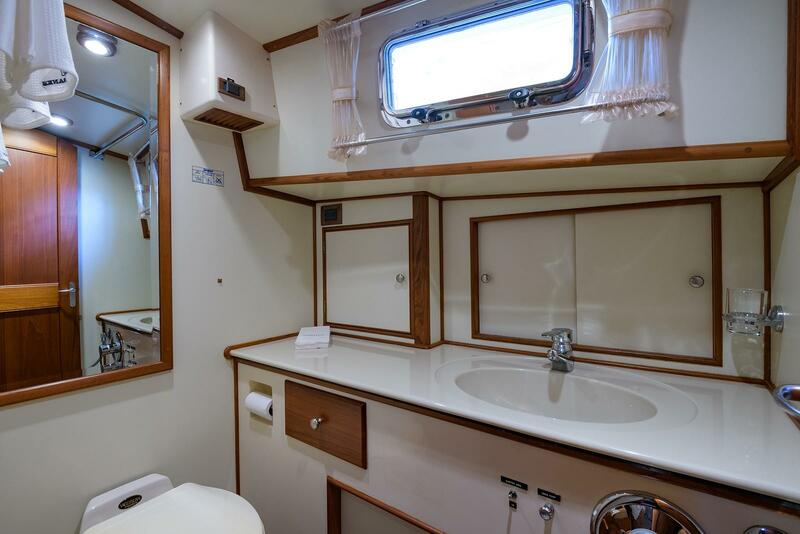 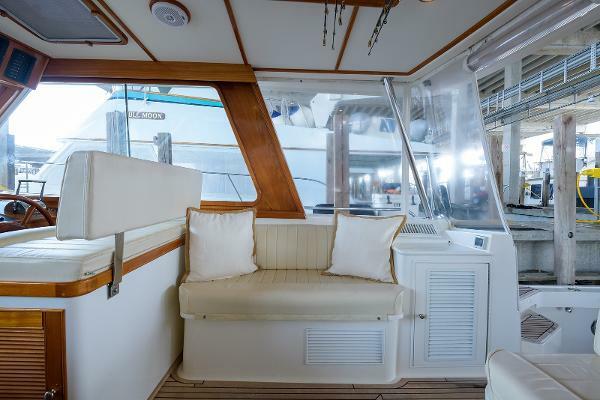 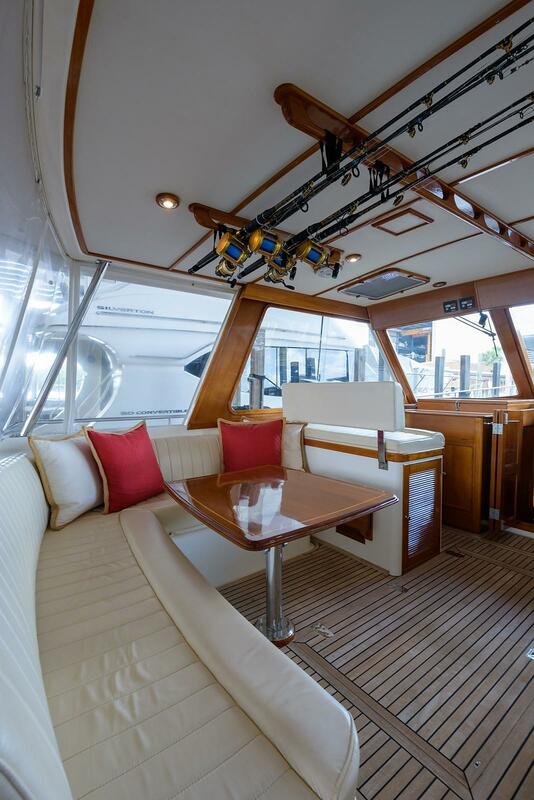 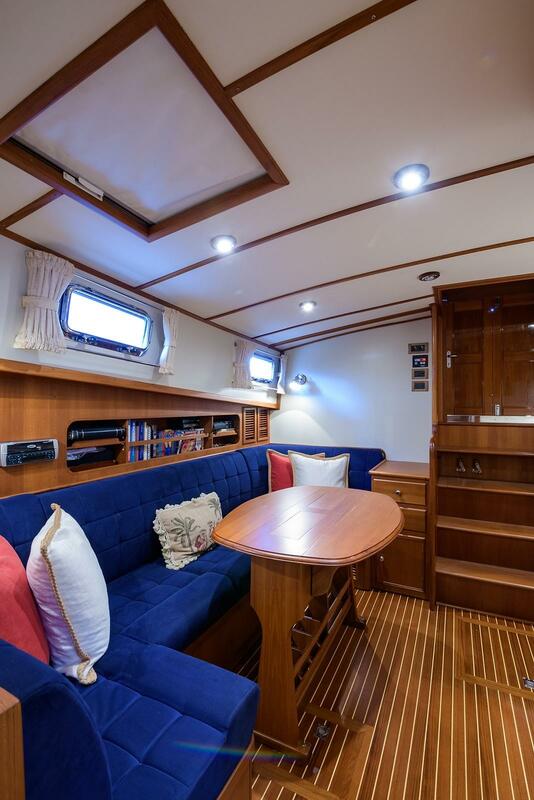 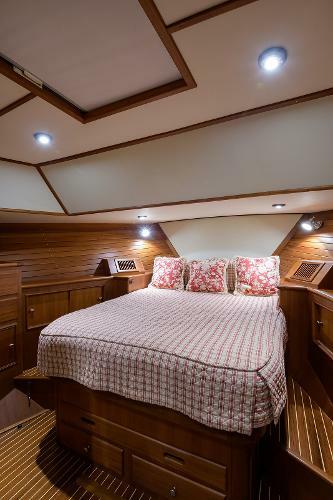 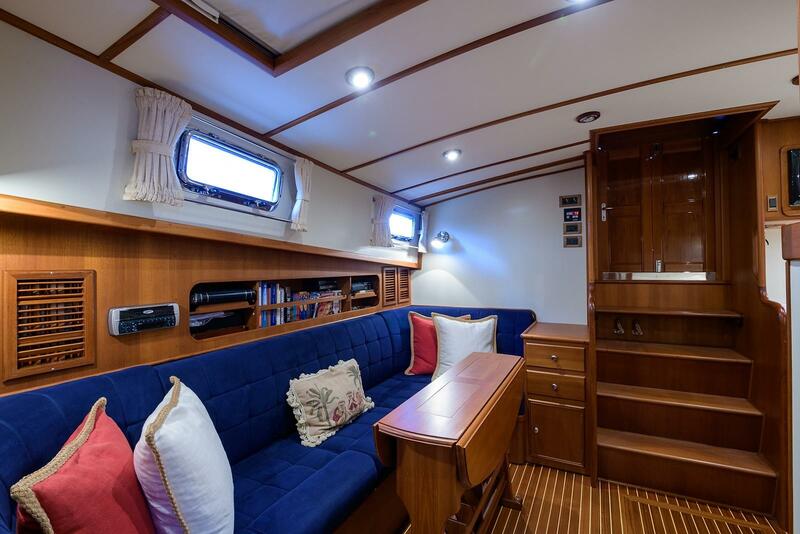 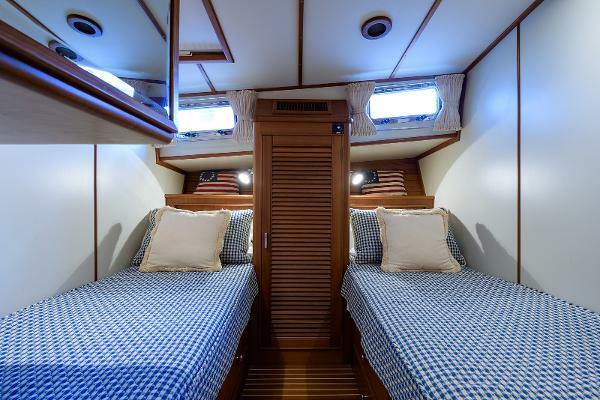 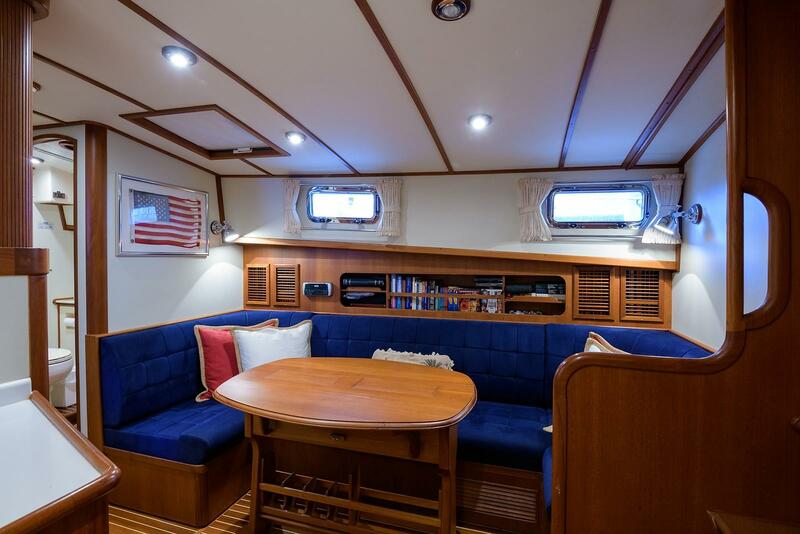 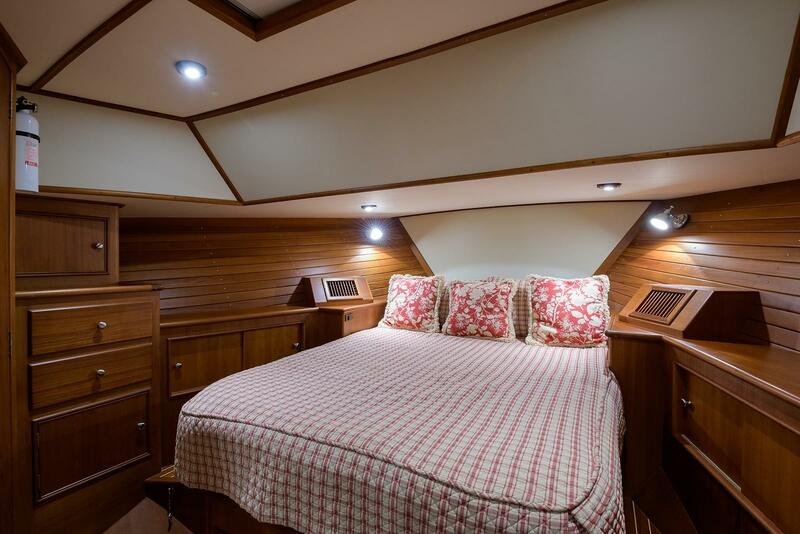 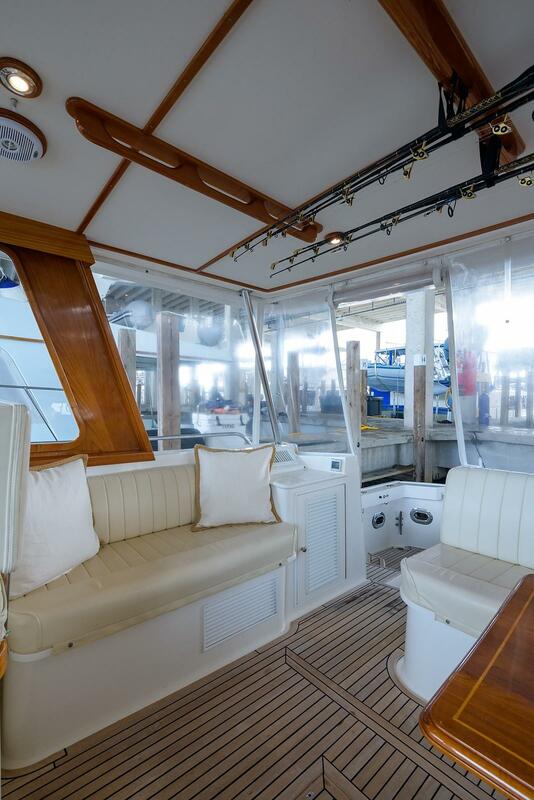 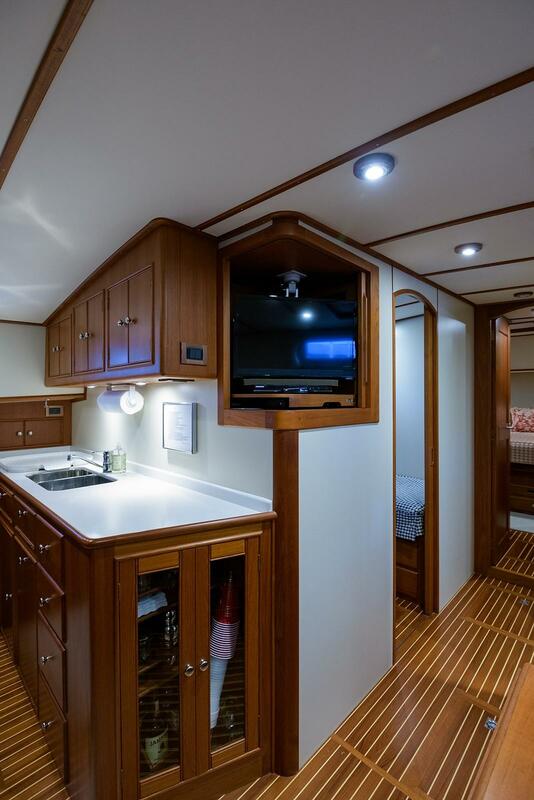 Ebbtide has the more desirable lower layout with a large U-settee across from the galley. 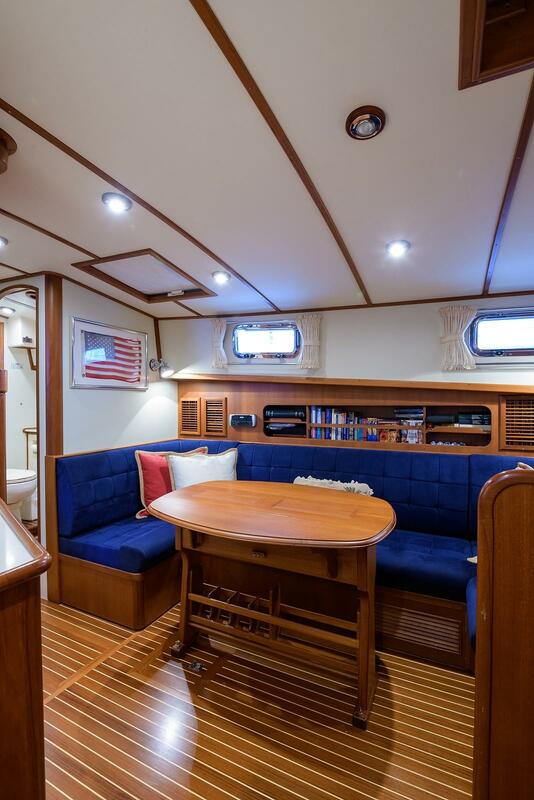 This provides a comfortable lower dining/TV watching or just sitting with friends or family, enjoying a glass of wine. 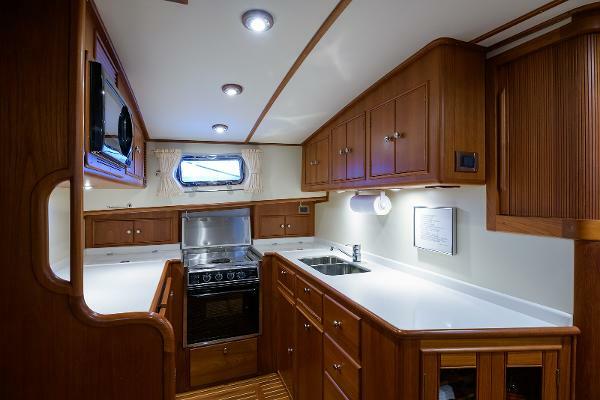 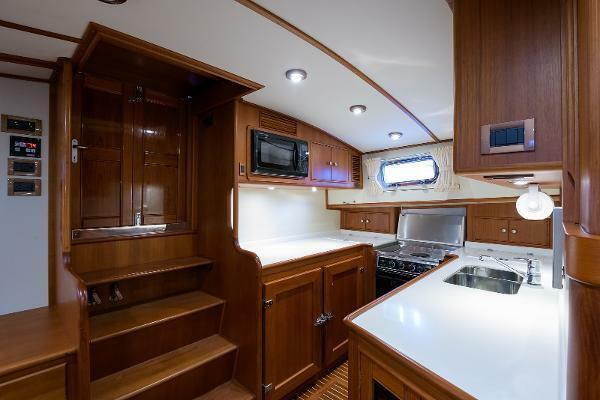 The Eastbay 49 has a large, U-shaped galley. 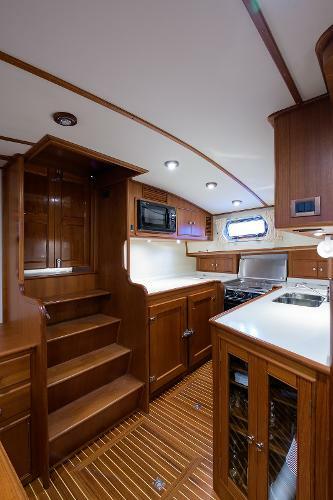 There is lots of counter space, and overhead cabinet storage, as a result. 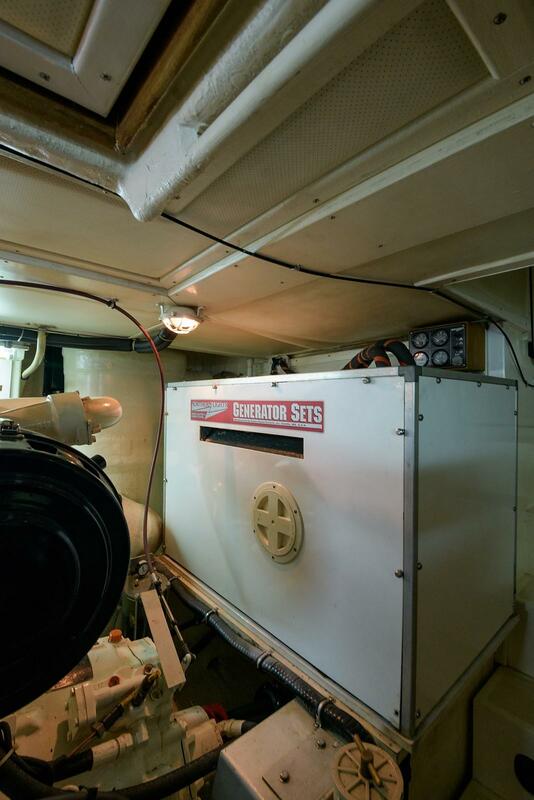 There is an exhaust fan to is vented to outside to remove cooking odors (or smoke!) 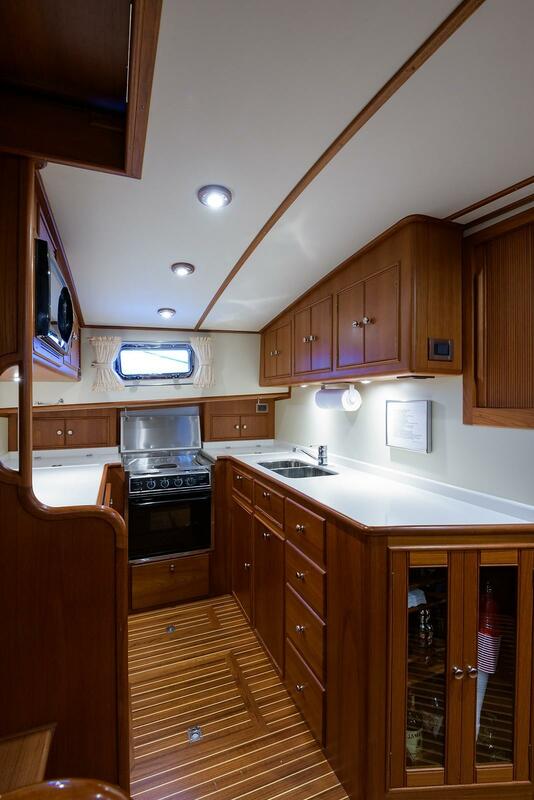 and a nice lighted, bar area forward, inboard galley bench. The master stateroom is forward and has a queen island berth, large bureau and other small storage cubby's. 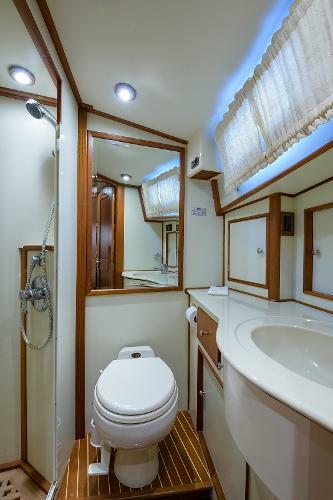 This is a very comfortable stateroom with ensuite head. Overhead hatch is large with an Oceanaire screen/black-out shade. 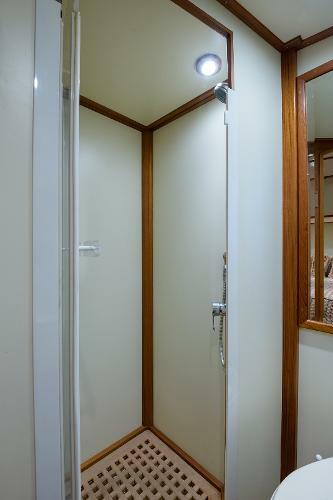 The master head is ensuite and offers a separate stall shower. 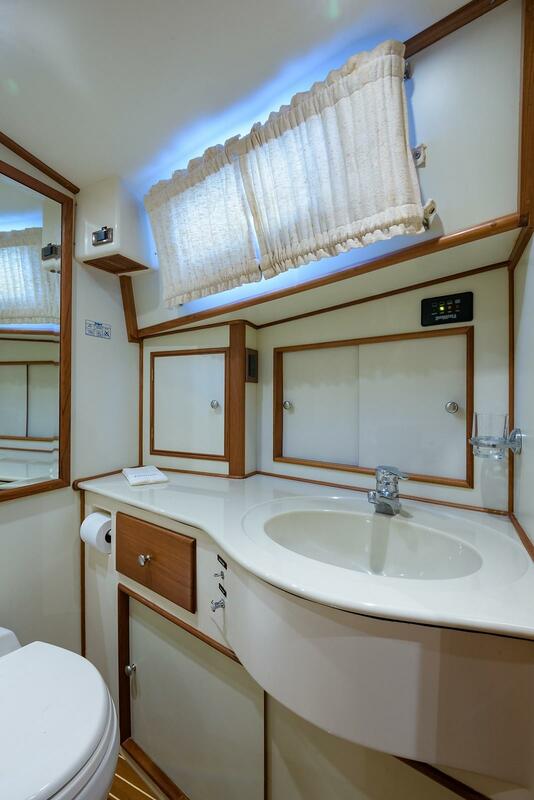 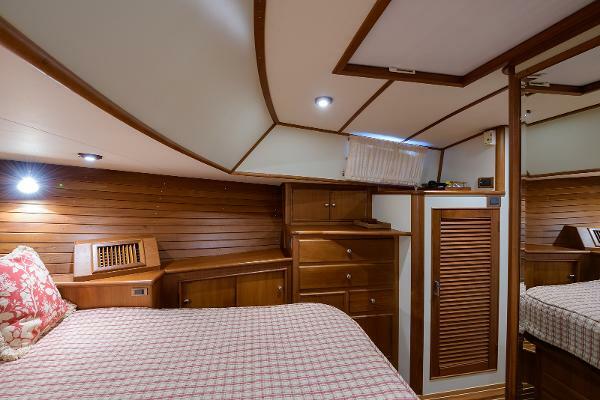 The guest cabin in generous in size and offers two twin berths that are side to side, or athwartship. 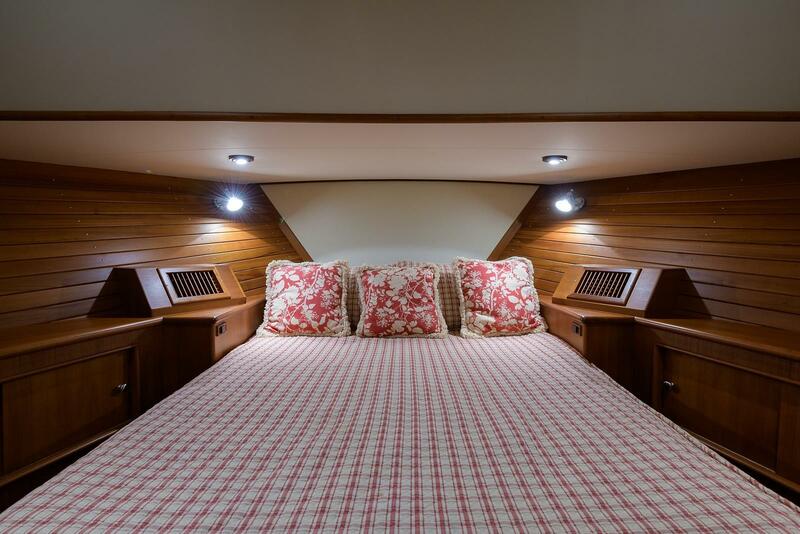 Each has an adjustable reading light. 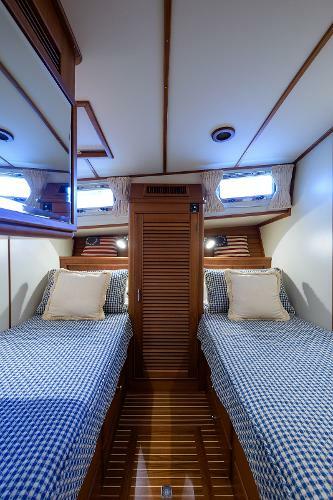 There is a teak hanging locker (cedar lined) between berths. 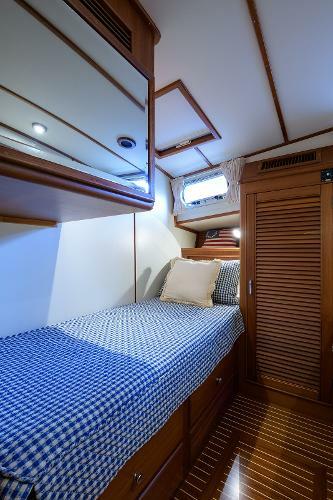 Each berth has drawer storage, underneath. 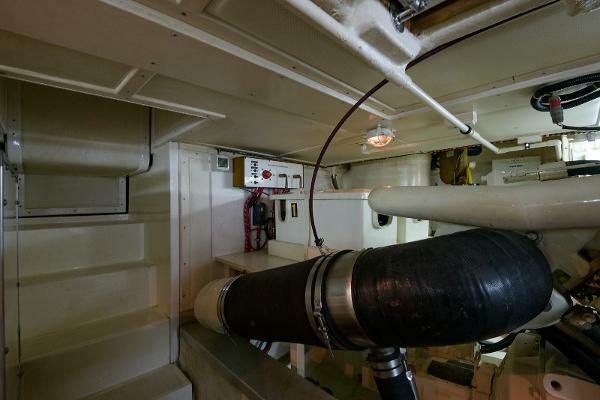 The guest/day head is across from the guest stateroom, easily accessed from the companionway.